Hi everyone. Today's card is for a couple of challenges. This week at SCS, the Free For All Challenge (F4A186) is to use gold on your card ... with extra points if it is an autumn theme. After seeing the Color Challenge at SCS last night, I realized that this also fits for it (although a couple of the shades are not exact). 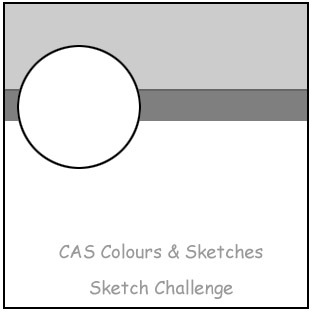 And I used CAS - Colours and Sketches - Sketch Challenge #42 for my layout ... I just moved the focal point lower on the page and made my card the standard size, rather than square. I hardly every heat emboss anymore ... it makes such a mess ... correction - I make such a mess! :), when using the powders. But when I saw the challenge to use gold, I knew right away that I wanted to emboss the outline of the maple leaf in gold. I don't remember the manufacturer of the gold embossing powder I have, but it has specks of other colors through it and is really pretty. I first randomly sponged Whisper White card stock with yellow, green, orange and rust and then stamped the leaf outline with Versamark and heat embossed with gold. Then I fussy-cut the leaves ... I am so happy with how it turned out. I sponged a quarter sheet, so I decided that since I already had the embossing powder out, I might was well stamp and emboss as many leaves as possible from the sheet. I managed to get three maple leaves and two oak leaves - bonus! I've used two maple leaves on the card above (one on the inside) and will save the other leaves for later projects. I used some twine that I got for as a gift a while back from my friend Debbie. It has a gold thread wound through it and it matches the embossing perfectly. A simple sentiment in Soft Suede ink finishes the card. Such a beautiful card! I love all the texture from your embossing and how you blended all those pretty fall colors...so elegant! What a gorgeous leaf, Loll! The card is stunningly simple, and I love the hint of gold in the twine. Beautiful card, Loll! The richness of the maple leaf against the crisp white background is such a beautiful contrast. What a beautiful leaf, Loll! Wonderful layout to show it off beautifully! Glad you could make some extras! Wow! What a gorgeous card! Love the elegant design and that leaf is just perfect!! Love the burst of colour from your gorgoeus leaf! Thanks for tips on how to make that. Your leaf is stunning and a great take on the sketch! What a pretty leaf, just love the sparkly veins, and such rich colors, great card Loll, all matches so well. Such a beautiful card Loll.The colouring on the Maple leaf is exquisite and looks fabulous with the embossing. Gorgeous! Your CAS designs are so perfect! Gorgeous card Loll, I so love leaves and this is beautifully coloured. The twine gives a perfect finish. Gorgeous! Love the twine; that leave is amazing! Thanks for playing along with us at CAS Colours & Sketches!